This bestselling book has been used in schools across the country to establish efficient and cost-effective systems of Tier II positive behavior support. The Behavior Education Program (BEP) was developed for the approximately 10-15% of students who fail to meet schoolwide disciplinary expectations but do not yet require intensive, individualized services. Clear, step-by-step guidelines are provided for implementing the approach, which incorporates daily behavioral feedback, positive adult attention, and increased home–school collaboration. In a large-size format with lay-flat binding to facilitate photocopying, the book includes reproducible daily progress reports, handouts, and planning tools. Purchasers also get access to a Web page where they can download and print the reproducible materials. See also the authors' related work on intensive interventions for severe problem behavior, Building Positive Behavior Support Systems in Schools, Second Edition: Functional Behavioral Assessment. 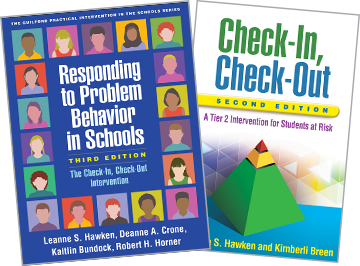 Also available: Dr. Hawken's training DVD, The Behavior Education Program: A Check-In, Check-Out Intervention for Students at Risk, which demonstrates the BEP in action.